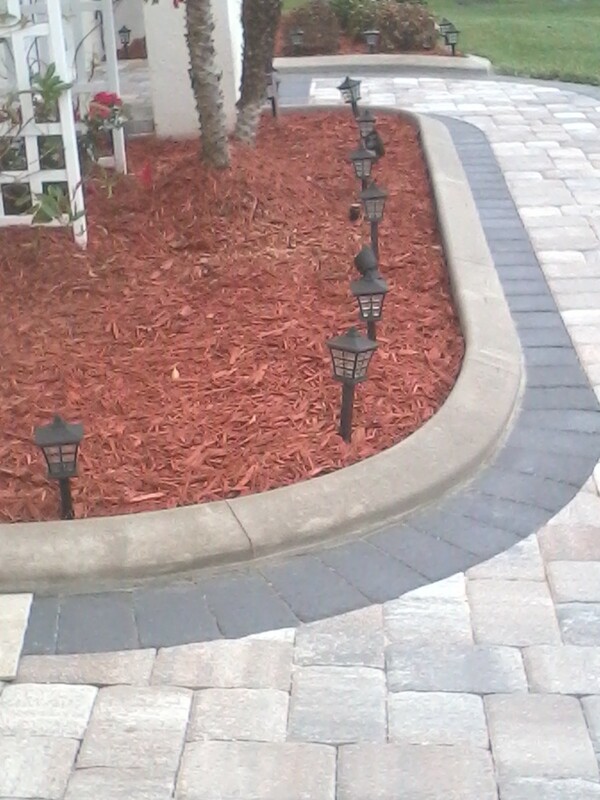 The owner already had the pavers, but he called us in to “finish” the look. Doesn’t it look great? We completed several hundred feet so far. Due to this time of year where afternoon thundershowers hit, we started doing ground prep on Thursday, followed up with curb installation on Friday. Unfortunately, the Friday storms ruined about 7 feet at the end of the run, but because THIS IS OUR PRIMARY BUSINESS, we went back on Saturday, cut out the damaged parts, and replaced them (at no additional fee for the homeowner). The homeowners were very impressed. 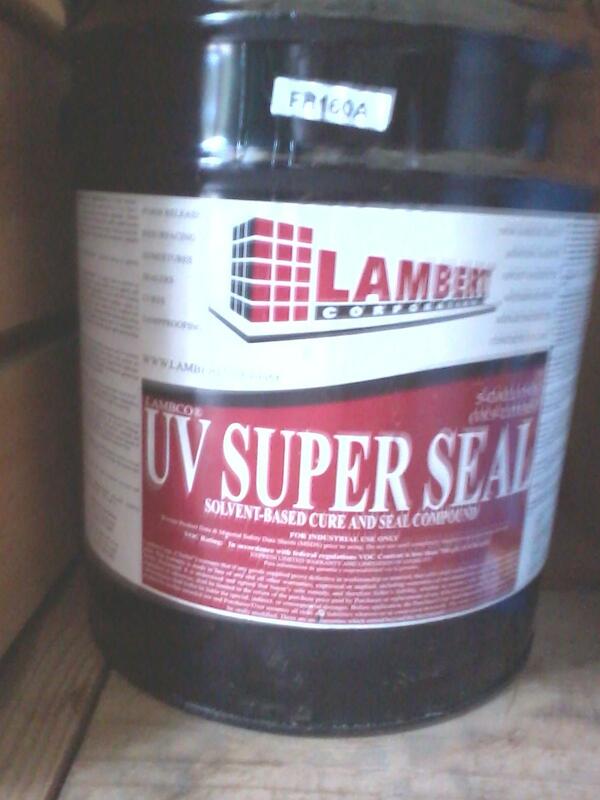 We back our work and guarantee our workmanship (certain conditions apply). Matter of fact, one of his next-door neighbors tried to get the similar job done by a “new” company in the area to save a few bucks; and to be quite frank, they did not install a nice job. Even though I always hope that Scott gets additional photographs so that I can share the difference of “bad” borders versus “great borders”, it can always get a little tricky. Many of the other companies in our area have other full-time jobs, and do this after hours to make a few extra bucks. Not Curb Appeal Concrete Landscaping Borders. We are full time, and customer satisfaction is our #1 priority. We try to keep our overhead low to pass on savings, and don’t spend a lot of money on advertising, so it is very important that our clients are happy with our work. That’s how we earn most of our business! Word of Mouth.., and what I post here. You can always take a look at our website to view information so as good borders, bad borders, what to expect, what’s available, and what to look for. We also give you ball park estimates so you can figure out if Curb Appeal Concrete Landscaping Borders is right for your yard, and how to measure the linear footage with a simply garden hose. We’re not going to steer you wrong. If you want “stamping” (pattern on curb), keep going. We don’t do that, and we explain why on our site. However, as a homeowner, we believe that you deserve the know and understand what you’re buying. 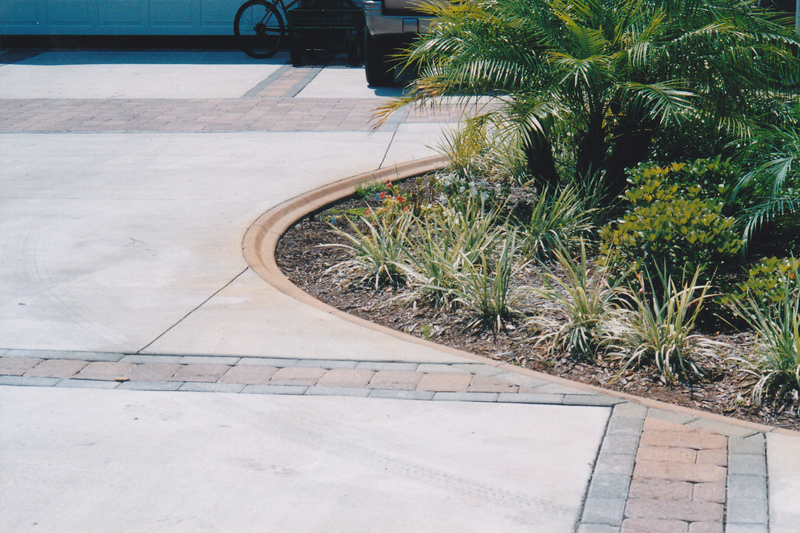 Please use our site to educate yourself, and decide if Curb Appeal Concrete Landscaping Borders is right for you! Call us today for YOUR free estimate! Now that the torrential summer downpours are here, are you noticing that your mulch is floating out of your flower beds into your lawn? Perhaps the mulch is spilling over onto your sidewalks making it more dangerous when you walk outside? 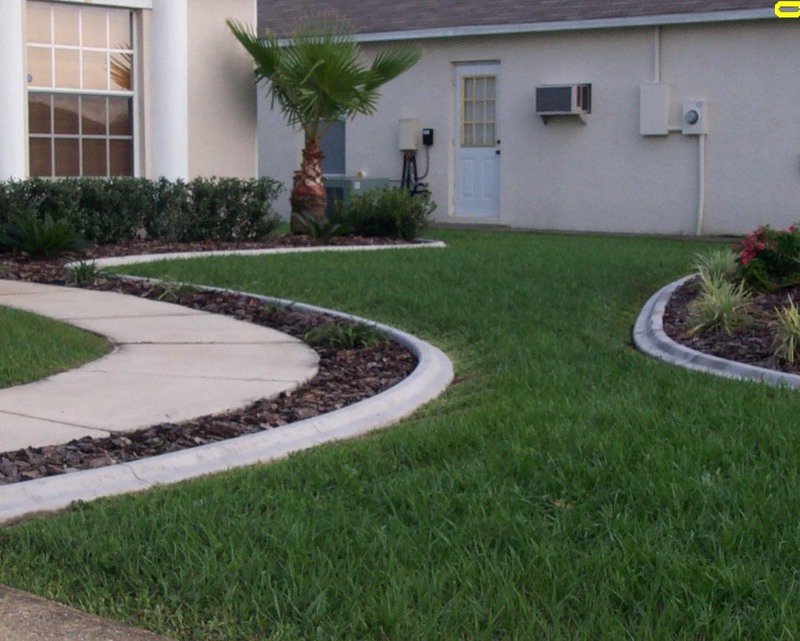 You should consider getting Curb Appeal Concrete Landscaping Borders. Not only will you “frame” your landscaping, but it will keep your family safer, and your lawn more appealing. 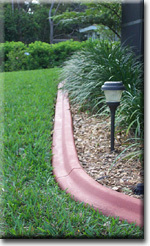 Our borders are designed with the homeowner in mind. Our mower style makes it simple to ride the wheels directly upon the edge, reducing “edging” time. The picture to the right here shoes no border whatsoever. 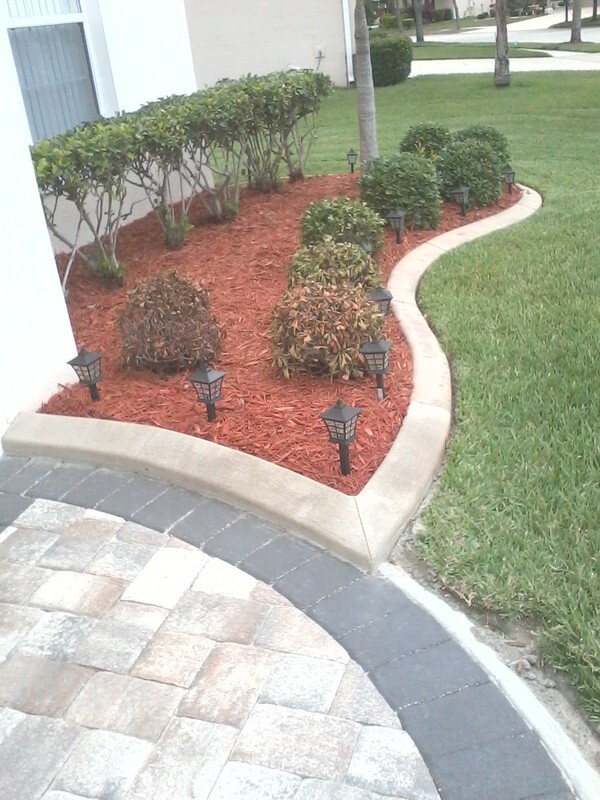 Grass can grow straight in, and the mulch can flow right out into your lawn. Here, to the left, you’ll see black plastic borders. I don’t think we need to tell you what is wrong with this picture. But, I can’t leave out the trusted ole wooden ties that are sometimes used. See the difference? 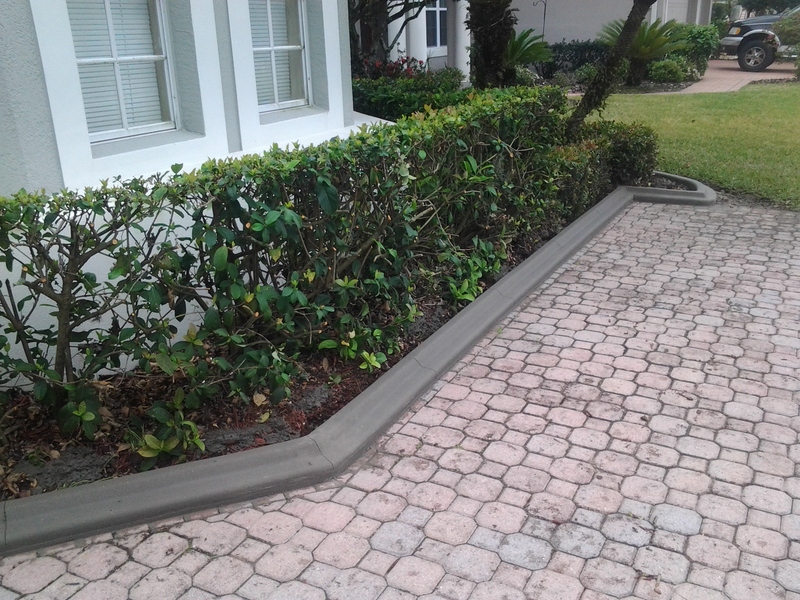 What you need to control and manage your landscape are concrete landscaping borders, and as a matter of fact, that’s exactly what we specialize in. 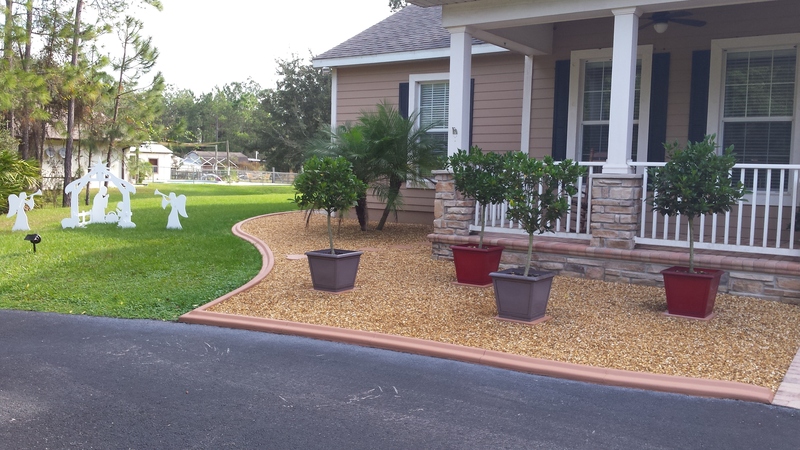 For over 18 years, this has been our sole business – creating a beautiful manageable landscaping design for thousands of Central Floridians. 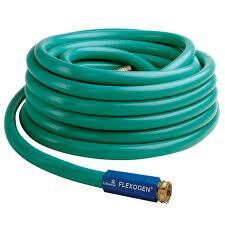 Keep your landscaping under control! We invite your to look at our website, as we give you options, advice and testimonials as well as recommended vendors that we’ve worked with throughout the years and found them to be exceptional. Tackle the upcoming rainy season by calling us today for your free estimate. We’re located just a stones throw from Orlando, which would be St. Cloud, Florida. Today, we were replacing curbs from some ‘other’ curbing company in St. Cloud. 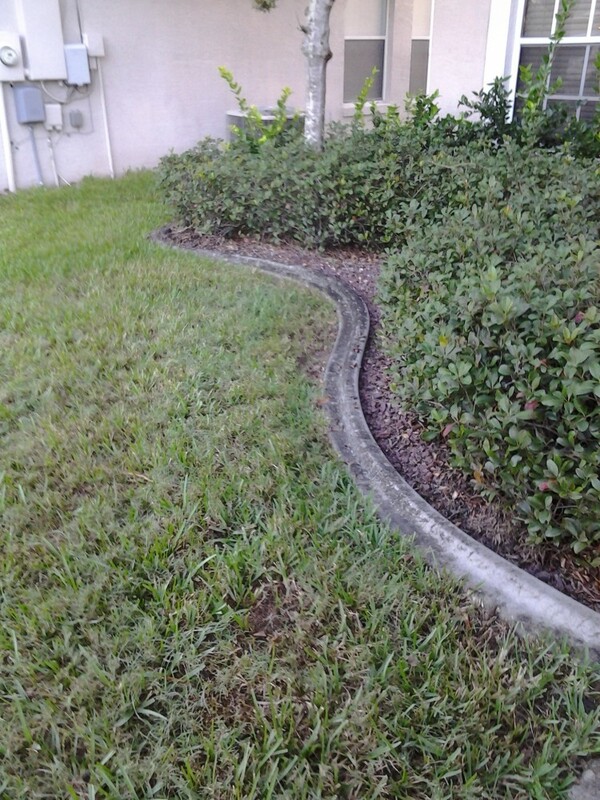 The unfortunate thing about it was that the owners didn’t know what to look for when it came to curbing. And, the ‘other’ company obviously installed their curbs before a rain-storm hit, so the curbing was badly pitted. They should have covered the curbs if a storm were pending, not just leave the job site. 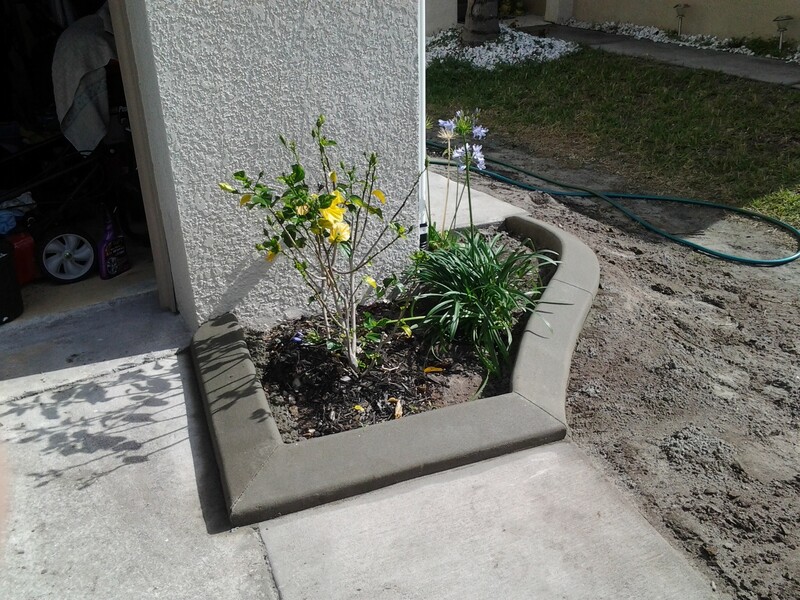 However, the damaged and crumbled curbs were picked up by Curb Appeal Concrete Landscaping Borders and transported quickly to the landfill! After-which, new borders were installed – with color! I should have the complete pictures for this job tomorrow, which I will share with you. Anyway, what I’m boiling down to is; do you know what to look for? Here is an example of what you definitely DON’T want with your borders. This picture was actually taken in 2003 by someone that hired us. For the record, these are NOT our borders. Notice how uneven and wavy the top is? This is just “crap installation” here. Can you see the difference? In this second picture, you see straight lines that are easy to mow around. For the record, these ARE our borders. You want your borders to “frame” and complement your landscape – not distract from it. 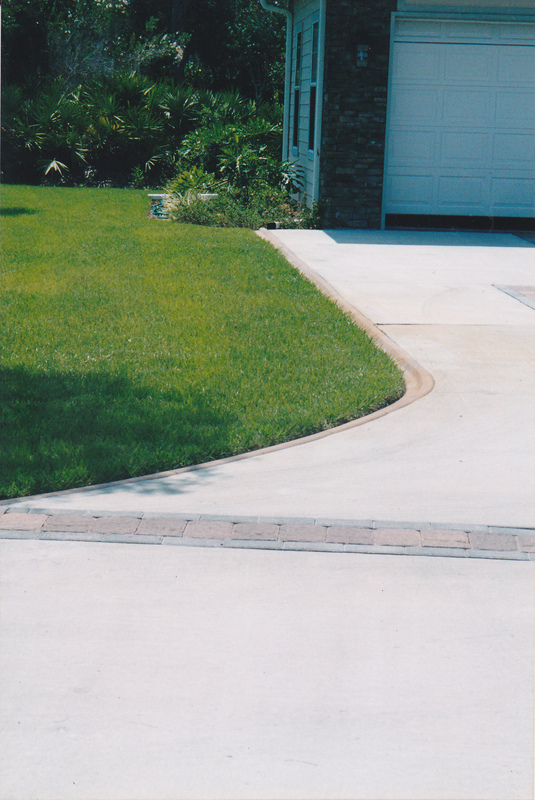 You don’t want “roller-coaster’ curbs – you want straight, smooth and level curbing. THAT’s how you frame your landscaping. 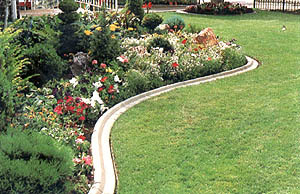 And, a big plus (know that the rainy season is upon us); concrete landscaping borders keeps the mulch in – and the grass out! Can they provide customer names for references? Guarantee’s? Will they come back for repairs? You wouldn’t believe how many companies fade in and fade out. We can proudly say that we’ve been doing Concrete Landscaping Borders in this area for 18 years. Shouldn’t you go with a successfully locally owned and operated company? This is the only business we have – full time! That’s us! Homework: You as a homeowner should do due diligence to determine if the company you select will be able to perform the job to your satisfaction; are able to complete repairs if needed; have a solid foundation of customer service; and a fair price. Research this site to give you prices, curb styles, color options, and how to measure. 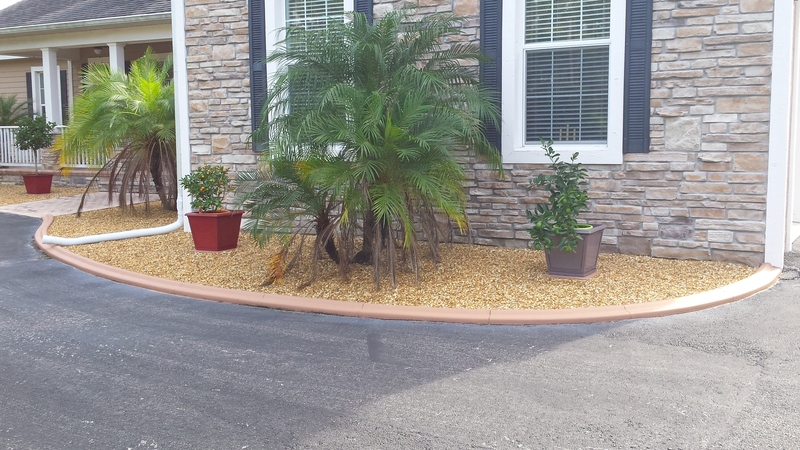 Curb Appeal Concrete Landscaping Borders has been operating since 1997, with thousands of satisfied customers. Please contact us today for your FREE estimate! Proudly serving Central Florida. Call 407-957-9208.